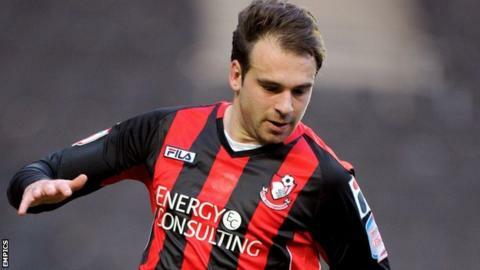 Bournemouth secured promotion to the Championship after overcoming Carlisle to record a club record eighth successive league win. The Cherries went ahead following a corner when Simon Francis's cross was powerfully headed in by Steve Cook. Lee Miller levelled from close range, but Harry Arter restored the lead from 20 yards and Brett Pitman sealed the victory in stoppage time. And after Brentford could only draw, the Cherries' promotion was confirmed. The Bees failed to beat already-relegated Hartlepool in the evening kick-off, and as they play second-placed Doncaster on the final day of the season, it is no longer possible for both teams to overtake Bournemouth. It represents a remarkable turnaround by the Cherries, masterminded by manager Eddie Howe, who found the club - which he has supported since he was a boy - in the relegation zone when he returned from Burnley in October for a second spell in the dug-out. The energy shown by both sides in the early stages promised an open game as Carlisle attacked with the freedom of a team guaranteed a mid-table finish. With Doncaster already losing, news broke of ex-Cherries stalwart Shaun Cooper putting Portsmouth ahead against promotion contenders Sheffield United just as Bournemouth's Lewis Grabban tested visiting keeper Gillespie with a low drive which he pushed away for a corner, but from the set-piece, Francis crossed for central defender Cook to head his first goal for the club. The home fans were soon chanting "play up Pompey" as the Blades fell further behind along the south coast at Fratton Park, ensuring they could no longer catch the Cherries. However, while Bournemouth's promotion push has been built on a defence that had only conceded two goals in a run of seven successive wins, they defended desperately at times. Rory Loy was given time and space in the box to swivel before crashing his shot against the woodwork, but his strike partner Miller, denied by a fine Ryan Allsop side earlier in the game, made no mistake with an overhead kick after Bournemouth failed to clear a corner. The equaliser seemed to shake Bournemouth into a higher gear as Arter fizzed a shot over the bar, minutes before the midfielder burst through to restore the Cherries' lead after Grabban's shot had been parried. Pitman then missed a gilt-edged chance when he blazed high and wide, but just after the game entered stoppage time, Arter set up Pitman to find the net for the eighth successive game with a cool finish which sent Dean Court into raptures. With Doncaster's defeat confirmed, the Cherries players and fans began to celebrate a promotion - while not totally rubber-stamped prior to Brentford's draw - to the second tier of English football for only the second time in their history.